In 1941, the Administrative Committee at Dumbarton Oaks appointed Wilhelm Koehler as senior fellow in charge of research, a position he would hold until 1944. Koehler was a recognized authority on Carolingian manuscript illustration and had come to Harvard University in 1932 as the Kuno Franke Visiting Professor of German Art and Culture. After Harvard’s medieval art historian, A. Kingsley Porter, died in a drowning accident in 1933, Koehler was chosen to replace him. We expect that eventually a certain regularity in the yearly turn-over of older Fellows into suitable positions elsewhere and their replacement by younger scholars will develop, which would provide at the same time for a continuous circulation of new blood. —Wilhelm Koehler, “The Dumbarton Oaks Program and the Principle of Collaborative Research,” Speculum 18, no. 1 (January, 1943): 118.
only by relating the “roving” to the monumental material will it be possible to make progress and to put Byzantine studies on a sound basis. But as the monumental material has never been systematically surveyed and organized, it is suggested that Dumbarton Oaks, which has made in the Census an outstanding contribution to the “roving” material, should now undertake the study of monumental material. List of illuminations and primary texts related to the monastery of St. John of Studios, Fontes. 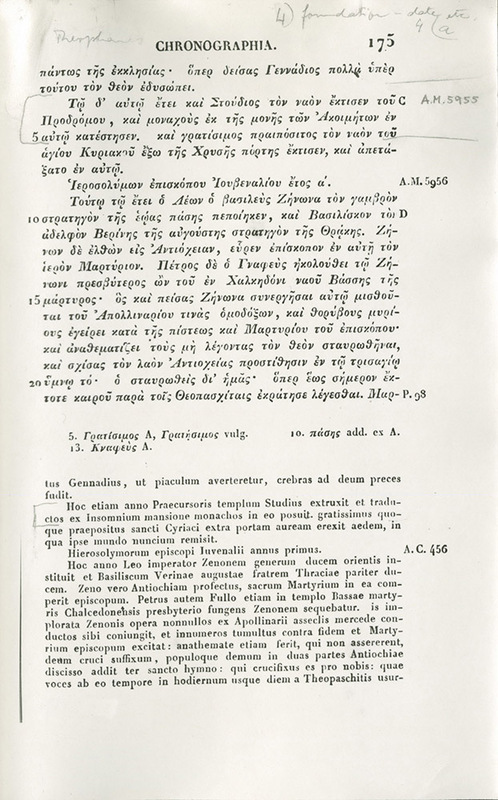 Theophanes the Confessor, Chronographia, text on the monastery of St. John of Studios, Constantinople, Fontes. 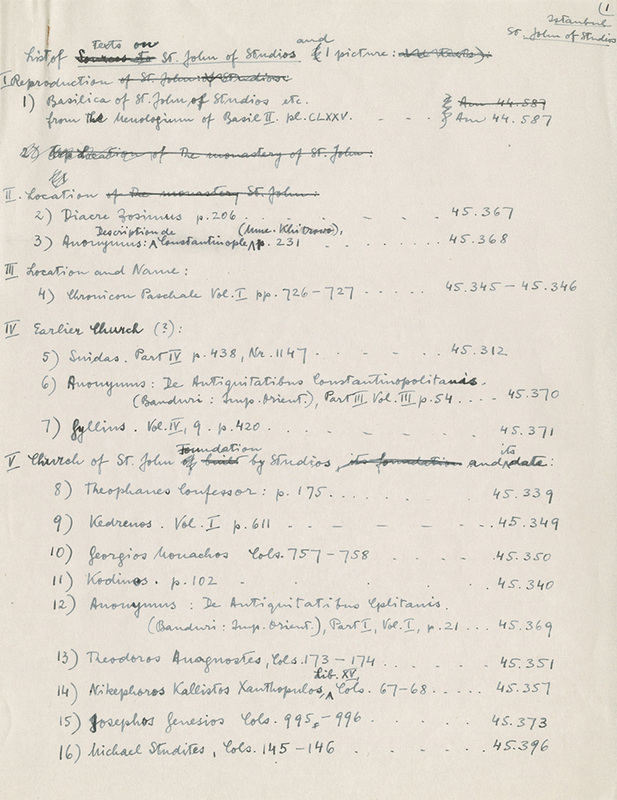 Koehler divided this work into two parts, which quickly came to be known as the “Fontes” and the “Research Archives.” Those junior fellows who were historians and philologists would work on the “Fontes” and search out primary textual sources for passages relevant to early Byzantine buildings. The junior fellows who were archaeologists and art historians would review the existing publications on Byzantine monumental structures and compile critical dossiers. There was no thought of going to study the actual monuments, as this was the height of the Second World War and travel was difficult at best. The long-term goal of this collective research was to be the publication of an anthology of relevant primary sources and the establishment of a “Research Archives” for the benefit of future scholars working at Dumbarton Oaks. Koehler articulated his vision for this academic program in a paper titled “The Dumbarton Oaks Program and the Principle of Collaborative Research,” which he read at a meeting of the College Art Association and then published in the journal Speculum. 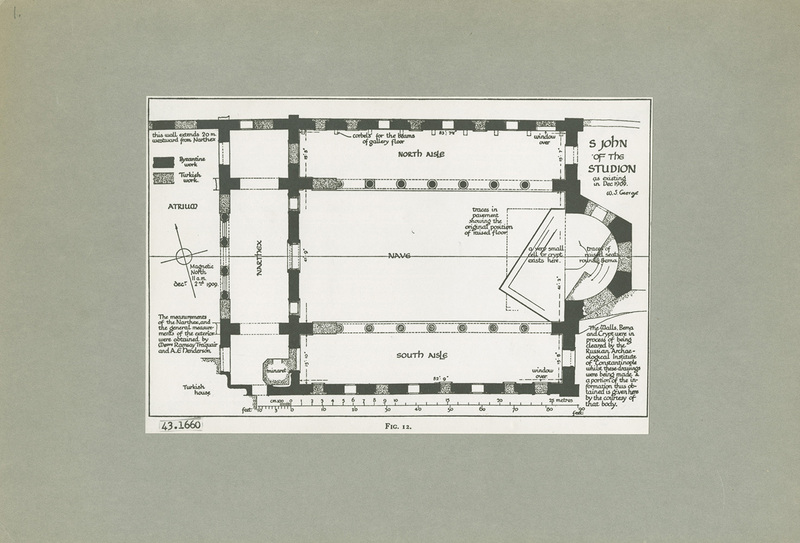 Monastery of St. John of Studios, ground plan, Research Archives. to coordinate the research of a group of scholars who are living in different places [would] be a difficult and strenuous task, requiring much unselfishness, much tact, skill and patience on the part of the scholar who is in charge of the project. the research program of Dumbarton Oaks implies that the individual efforts of a group of scholars are directed towards a common goal of broad historical scope [which is] the clarification of the origins and of the development of early Byzantine art. That means that to a certain degree the individual scholar yields his independence in favor of collaboration with other scholars. [Moreover,] the close contact between collaborators stimulates the efforts of the individual and provides the basis for constructive criticism on the one hand [and] for reciprocal advice and support on the other. Interestingly, in this period of the Second World War, Koehler equated the collaborative research model to the model of democracy: the functioning of the individual needed to be channeled to the greater need of society, which was a fundamental principle of democracy. correlate its development with the background of institutions, religious thought, liturgy, and social and economic development, and other aspects of eastern history, local and general. For the interpretation we will need cooperation between the historian of art, the specialists in social and economic history, the experts in the history of the Church and those interested in Geistesgeschichte and other related fields. Koehler’s collaborative research plan at Dumbarton Oaks was not destined to endure, however. The catalyst for its abandonment was the arrival at Dumbarton Oaks in 1943 of the Princeton University medieval art historian, Albert Mathias Friend Jr.